Thoughts and reflections driven by a life well lived. Managing Change and Transition …Put one foot In front of the other (and don’t look back). In life we learn through literature that there is big stuff and small stuff, as in “Don’t sweat the small stuff.” There are things that are key, critical–that go to the core . In the “small stuff” column we find the discretionary, optional and elective. 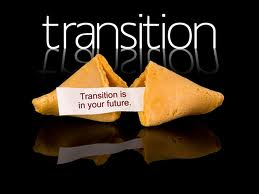 Among the “core” things in life, and possibly one of the most critical one can master on this planet, are transitions. The ability to transition from point A to B, or to put in its simplest terms, to move on. You’ve heard often about the person who “doesn’t handle transitions well.” At the same time, we’ve all witnessed people who have faced seemingly overwhelming odds, yet have managed to reinvent themselves, transition and emerge no worse for the wear. As I scoured the web for visuals that represented transitions–it was interesting how many aspects of life involve transitions. That was only matched by the realization that the person who hasn’t mastered transitions, or the ability to finesse one gracefully, likely faces an uphill climb over and over again. Transitioning affects us all, more or less, depending upon our circumstances. The spectrum in which it presents is broad: in or out of a relationship, quitting or leaving a job, losing a loved one, going to school, leaving school, changing school, moving out of one house and into another, divorce, retirement or other fundamental passage. In an earlier post, I wrote about people plagued by inertia–but I may have to stand corrected. It may not be so much the inertia, but a fundamental inability to manage change that is at the root of the paralysis. 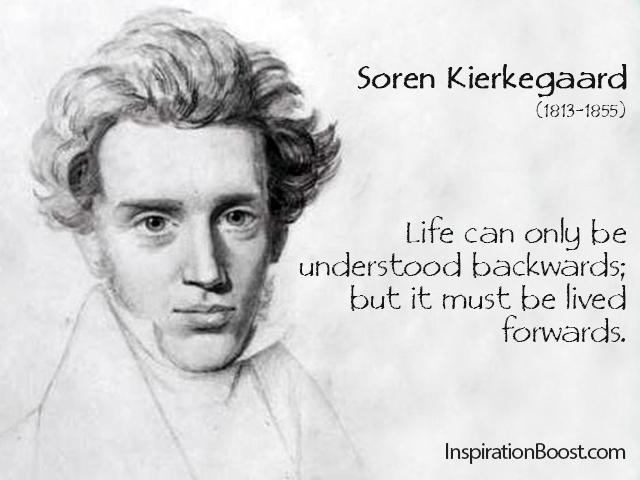 I didn’t spend much if any time reading or studying Kierkegaard in my years studying philosophy, but this “inspirational” quote seems to get to the heart of the matter. At a relatively young age, I was confronted more than once with some of life’s “fundamental passages.” In later years, but well before adulthood arrived, I was exposed to adults who represented both extremes on the transition scale. On the one hand a parent who was entrenched in past recriminations and regrets , on the other hand a grandparent, who at the drop of a hat, could transition into a new plan if any part of the present was presenting an obstacle, literally and figuratively, to where she wanted to be or where she wanted to go. Perhaps the exposure to these two approaches, paired with the several transitions I was exposed to at so early an age as to think them natural, is what influenced me and my outlook on life. Whatever the source, that outlook has served me well. Confronting passages and transitions without paralyzing fear, regret or apprehension and harnessing the ability to manage expectations grows confidence in one’s own wings. Confidence prevents the kind of procrastination that is responsible for so many of life’s missed opportunities. Good timing then, often mistaken by onlookers as “good luck,” generates positive outcomes. But this process, and it is a process, requires conscious thought–no bumbling about, being buffeted by the “slings and arrows” of life. It requires that one acquire a penchant for flexibility, adaptability, willingness to consider change and acquire a zest for the anticipation that transitions generate. In the end there are two types of people, those who become fluent in the art of transition and change and those who are simply, sadly, stuck in the past or the memory of it. Put one foot in front of the other…and, I might add, don’t look back. If it helps, whistle the tune below, or in the manner of Jimmy Fallon, grab a bunch of muppets and sing your way through the transition. Either way you’ll be off to something of a start. This entry was posted in Change, Jimmy Fallon, kierkegaard, Kierkegaard, Meaning of Life, Old Fashioned Wisdom, Philosophy, The Big Picture, The Tonight Show, Transition and tagged change, Jimmy Fallon, Kierkegaard, The Tonight Show, Transition. ← What’s it all about Alfie? Hidden Gender Agenda in Hallmark Christmas Movies? The lawyers will save us all.